It may only be mid-November, but in #TCTheater, the Christmas season has already begun! 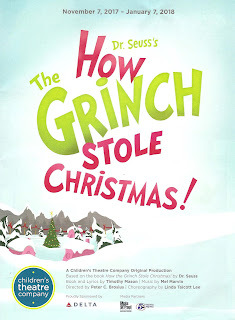 My first holiday show* of 2017 was an oldie but a goodie - Children's Theatre Company's How the Grinch Stole Christmas. 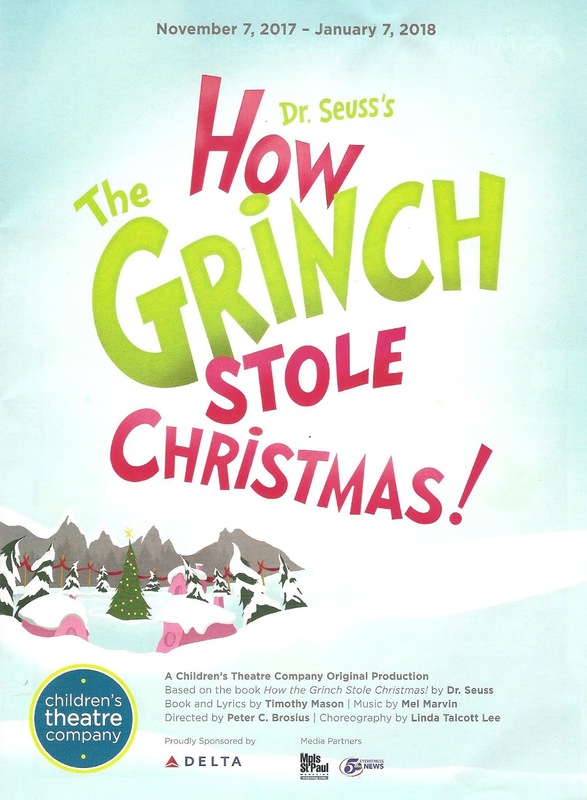 A CTC original adaptation of the Dr. Seuss class (with book and lyrics by Timothy Mason and music by Mel Marvin), The Grinch premiered in 1994 before moving on to other stages, including Broadway. I first saw it 2014, when I wrote, "it's a bright and colorful, silly and funny, sweet and heart-warming tale of redemption and love." I'm happy to report this is still true, no matter how many times you've seen it. 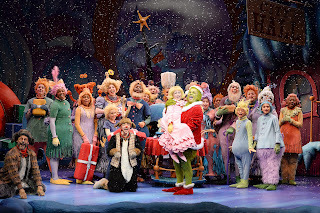 In a less than two-hour visit to Whoville, the show will make you laugh, warm your heart, and hopefully remind you of the real reason we celebrate any holiday - family, friends, and being together. When I saw the show three years ago, Max Wojtanowicz was filling in for CTC company member Reed Sigmund for a few weeks. 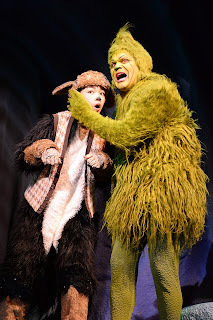 Max was wonderful (as he is here as Grandpa Who) and left nothing lacking, but the Grinch is sort of Reed's signature role, so I was excited to see him perform it. I'm not sure how many times he's played the role, but he's figured out how to milk every word, every moment, every movement of everyone's favorite meanie. It's such a treat to hear him spit out Dr. Seuss' words, or whisper them, or scream them in an audience member's ear. Because watch out, the Grinch walks through the audience at his most mean. But I'm pretty sure being yelled at by the Grinch has got to be the best Christmas present of all. Reed Sigmund as the Grinch is an example of an actor who knows his role inside and out and gives it everything he's got, to the most entertaining effect. The rest of the cast is pretty great too. Natalie Tran has graduated from the role of Cindy-Lou Who to young Max, and is an adorably sweet and eager puppy. CTC company member Dean Holt is the older, wiser, slower dog, who narrates the story with nostalgia. The two often mirror each other's movements, showing the connection between them. The entire ensemble of children and grown-ups alike are so joyful and fun to watch as these oddly shaped and colorful creatures, and director Peter C. Brosius and choreographer Linda Talcott Lee keep everything moving smoothly in organized chaos. Last but not least, special mention must be made of Mabel Weismann as the purest soul in Whoville, Cindy-Lou, the one who melts Mr. Grinch's heart (along with everyone in the audience). The original songs are fun and well performed by the cast and live pit orchestra, directed by Victor Zupanc. The CTC stage looks like something right out of a Dr. Suess book, with cartoonish and playful set pieces (by Tom Butsch), and bright and colorful costumes that are somehow cute despite being the most unflattering shape - a bit wide at the hips and high in the forehead (by David Kay Mickelsen). 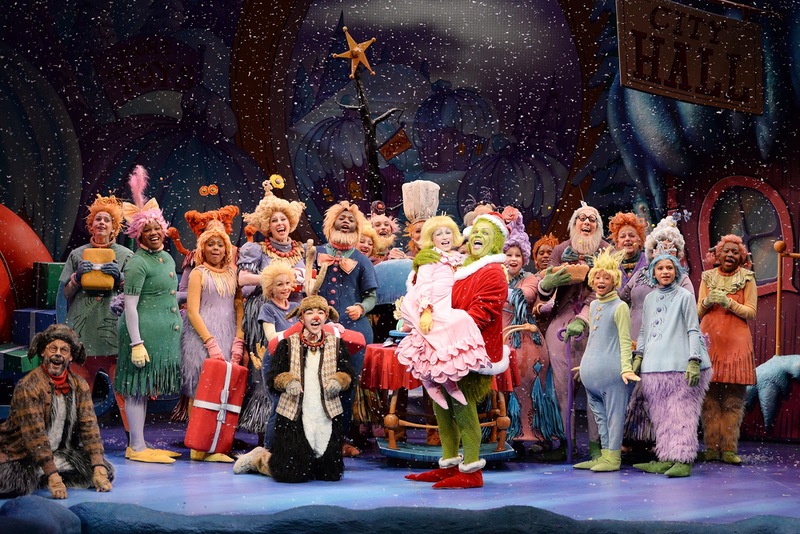 How the Grinch Stole Christmas continues through January 7. Bring your little Whos for a fun and heart-warming holiday treat, or go by yourself - I've learned that it's OK for adults to go to the Children's Theatre by themselves. This Grinch is fun for adults, children, Whos, and furry green grumps. *To read about all of the holiday shows I've seen this year, click here. **Plot summary and other text borrowed from what I wrote about the 2014 production.